Madhubani Painting originated from madhubani district of Mithila region of Bihar. Madhubani paintings are drawn in accordance with a fixed theme and accordingly symbols, lines, patterns are drawn. Madhubani Paintings belong to the category of folk art.These paintings mostly depict nature and religious motifs and the themes generally depict dieties,nature,fishes,peacock etc.Natural objects like the sun,the moon, and the religious plants like tulsi are also widely painted,along with the scenes from the royal court and social events like weddings.The paintings are done on handmade paper,canvas,dupattas,stoles etc. In this workshop, Madhubani art form and its different methods will be explained in detail. 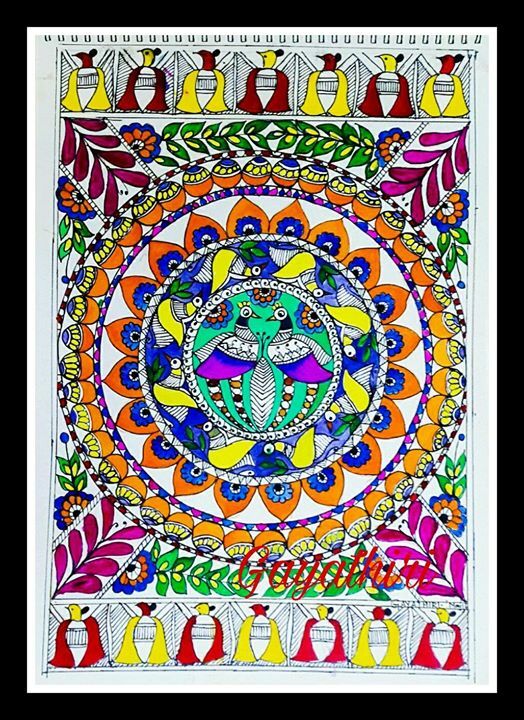 The Traditional style of Madhubani painting will be taught in the class on a A3 size handmade paper. All materials will be provided in the class. Materials include: Nib pen/Marker,Colours,Brushes,handmade paper. Day 2: Madhubani Coloring techniques, Completion of the Madhubani Picture.